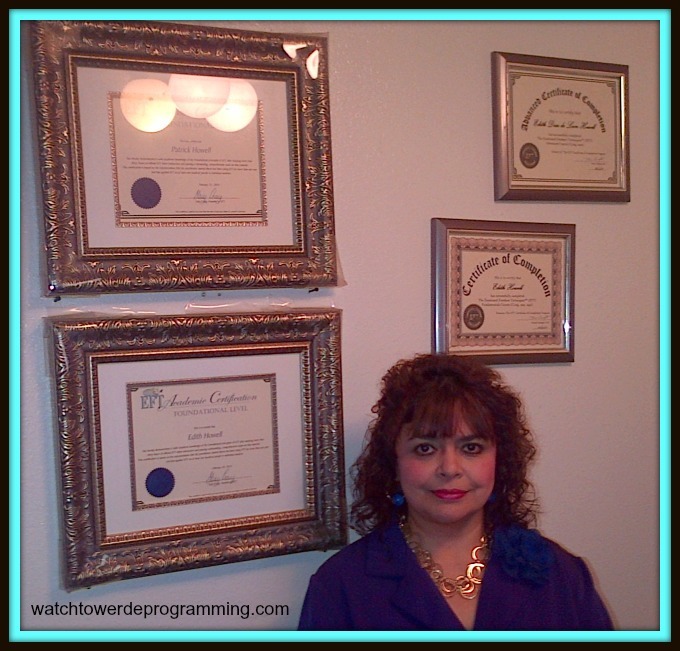 I AM EDITH HOWELL, EFT PRACTITIONER CERTIFIED BY GARY CRAIG, THE CREATOR OF EFT TAPPING THERAPY. EMOTIONAL FREEDOM TECHNIQUES. Here is my confession, I suffered with Chronic Fatigue Immune Dysfunction Syndrome, CFIDS/M.E., CFS. An incurable disease from the medical perspective for over 14 years. CFS really devastated my mindandbody and my life and the lives of my children because I was so sick to be the active mother that they needed. I really had a huge problem because no medical or alternative treatment helped me at all. * The Official EFT Certification, EFT-CERT-1 from Gary Craig. I specialize in working with people who are suffering the devastating effects of CFS/CFIDS/M.E. SEXUAL ABUSE and a TRAUMATIC CHILDHOOD. I help them clear their emotional pain, traumas and the emotional negative contributors to their problem so they can heal their heart and their body, learn to love themselves unconditionally, have more energy, joy and peace and be fully alive! Plus, I am adding my gift of intuition and all the lessons learned the hard way while dealing with a devastating incurable disease. My family and I were desperate and frustrated when time after time conventional medicine told us that: “There is no cure for CFIDS.” They treated some of the symptoms with medicine. But western medicine does not have a cure for this mysterious disease. Throughout the ordeal and with a diminished mental capacity, I kept investigating and reading, trying to find some kind of help. I tried vitamins, herbs, detoxification, juices, magnets and I even went to a specialized holistic clinic in Mexico. Here in the USA, I worked with the Chief of Infectious Disease for more than 14 years . I worked with other doctors, 2 of them prescribed me so many different medicines, antibiotics and supplements, but sadly I never got better. Thanks to my training with EFT, I learned to find “core issues and patterns” behind this very complex illness. I began to peel away the many different layers of this horrible disease. Furthermore, EFT helped me to be aware that anxiety and stress are behind many diseases, including CFIDS. I realized that my anxiety had been out of control for a long time. And as I addressed and eliminated “my emotional baggage,” I noticed that I experienced a reduction in physical symptoms. With all this EFT work, my energy system and my immune system is coming into balance, which contributes to a peaceful and healthy mind and body. During the first years with CFIDS, I suffered pneumonia and several cases of bronchitis. I felt so profoundly weak and that (dying feeling) seemed to go deeper into my mindandbody. Thanks to my doctors I was able to survive the bouts with pneumonia. If you suffer this illness and the devastation that comes with it, try to find reasons to feel grateful. If you are able to open the door and look outside, feel grateful for that…It will change your day! I am so grateful to EFT, because it helped me to clear Bone-Crushing, Soul- Smashing Fatigue. For many years, I could not even go to the store; my husband had to push me in my wheelchair. As I look back and remember when my children were very young, and I had to take them to school, the hallway leading to their classroom seemed to me like a long, and overwhelming avenue. I was so disabled by my physical weakness that I had to lean on the walls for support and I tried to walk as close as possible to their classroom. Many times, I stopped when the door was visible to me. I could see my children walk through it, and then I sat on the bench trying to rest until I could walk back to the parking lot. I am really, really sorry that CFIDS robbed me of some precious events in my children’s lives because I was too sick to attend. If you are a CFIDS patient, you know what I am talking about. You are familiar with the emotional and physical pain, the sadness and the frustration. The lack of compassion you get from people because your invisible illness does not show. You feel like you are dying in in front of them, but they do not see it. Remember to forgive yourself for the things that you could not do, you did the best you could with the little energy you had!! Honor yourself, recognize your own merit because living with CFS/M.E. is not easy. Now is the time to take care of your emotional and physical needs first. Your body is giving you tremendous signals, listen to them. Don’t ignore them. The truth is that I could have never cleared any of these painful problems associated with CFIDS without EFT. My new energy levels have allowed me to help people eliminate their emotional trauma and reduce their physical pain, increase their self- confidence, clear their childhood trauma, be joyful, and feel that they are fully alive in their bodies. This is my story and how I know that EFT Emotional Freedom Techniques works.